The managing partner of Blakemores – which was suddenly closed on Monday – said the firm was almost saved by its consumer-facing Lawyers2you brand but succumbed to a string of financial blows. The midlands firm was closed following an intervention by the Solicitors Regulation Authority (SRA) after the watchdog lost confidence in its ability to turnaround its finances. A statement from the SRA said it was “necessary to intervene in order to protect the interests of clients”. It is one of the biggest interventions ever. There is no allegation of impropriety against the firm and the SRA has not suspended the partners’ practising certificates. In a candid interview with Legal Futures, Blakemores managing partner Guy Barnett said all 250 staff at the Birmingham and Leamington Spa-based firm were now out of a job and the partnership of 12 faced the possibility of insolvency. He said a string of factors had built up since 2009 to cause the firm financial problems first reported to the SRA a year ago, and argued that after months of daily contact and good relations, the SRA had then acted too hastily given action he was taking over the weekend to sell the firm’s personal injury practice and generate cash flow. Mr Barnett revealed that the firm was also close to securing a deal with a private equity buyer to save the business, but that it fell through a week ago after a period of poor billing at the start of 2013. He said: “In the last three months we’ve been in negotiations with a private equity company looking to purchase specifically the Lawyers2you model, but prepared to acquire the whole business. Mr Barnett said Lawyers2you was generating approximately half of the firm’s £10m annual turnover and that the direct marketing tool was cheaper than paying referral fees, despite a bigger marketing budget. He said that in the last three years, the work Lawyers2you brought in via its dozens of stands in, predominantly, shopping centres, was also complemented by an additional £250,000 profits for a further 12 stands elsewhere in the country as he rolled the concept out on a franchise basis, with 145 firms on its panel to receive the referrals. Lawyers2you was heralded by market experts as a way of generating work to replace the reliance on referrals and Mr Barnett revealed that it had been originally conceived because of financial problems caused by referral relationships that ultimately sowed the seeds of the firm’s demise. 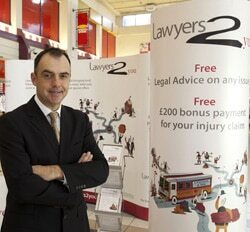 Mr Barnett said: “The Lawyers2you model gets a lot of publicity. It had nothing to do with the firm’s financial problems – they were caused by core business issues. Mr Barnett said the “collapse” of Blakemores was caused by a number of factors, including claims fraud, the property crash, changes to legal aid, and lending issues. He said the downfall began in 2009 when the firm’s PI department was the subject of “fraudulent claims” from several claims management companies, resulting in a £1.2m loss in referral fees, disbursement and work in progress. That represented a “substantial hit” of more than 10% of the firm’s revenue over two years. And as the conveyancing market shrank in 2009, and problems arising from referrers caused further trouble, Blakemores made three rounds of redundancies over the following 18 months, reducing the number of solicitors and paralegals in the department from 30 to four. The firm responded by creating Lawyers2you and “things started to improve” in 2011, said Mr Barnett. But when one of the firm’s funders pulled out of the legal sector, it capped Blakemore’s £2m facility and the loan had to be reduced to £1.8m – leaving a £200,000 cash hole and triggering a £3m austerity savings programme within the firm. Mr Barnett said: “We suffered cash flow problems and got into £750,000 arrears with HMRC. We breached our overdraft and went into business support – that’s what’s probably killed us.” He said the business support process required hefty payments in fees to a variety of advisers. Management formulated a ‘turnaround strategy’ 12 months ago to trade the firm through. They agreed a payment arrangement with HMRC, with £550,000 now paid off, and Mr Barnett said “things were looking up”. But in November 2012 they dealt with a very large PI case with much-needed legal fees in excess of £600,000. However, creditors took £150,000 from that cash flow, which “upset the strategy”. In December, the Legal Services Commission audited the firm and demanded £300,000 in legal aid recoupments and Blakemores, realising its turnaround plans were “increasingly fragile”, sought a buyer. Mr Barnett said changes in government policy in legal aid allocation had also led to the firm’s immigration and asylum department dealing with a reduction in matter starts from 750 to 100 – and a redundant purpose-built drop-in centre. He predicted that “hundreds” of firms in similar sectors could also be “on the brink”. “The Legal Services Commission is auditing everyone to get money in, but [the process] is shutting lots of firms down. This won’t be the last firm to go under. They’re queuing up and it is brought about by too many hits in the sector. Because Blakemores is not an LLP, Mr Barnett said the 12 partners are all jointly liable. He added: “I came into work [on Monday] and arranged for our staff’s pay to be brought up to date, but when the SRA does an intervention, it freezes all the firm’s assets. It came as a shock to me. We had been in daily dialogue with the SRA over 12 months, but when they intervene, they don’t tell anyone.” Had the intervention taken place an hour later, he said, staff would have been paid. Mr Barnett argued that the SRA should have waited a week to see the result of the sale of the personal injury practice. Blakemores is one of the largest SRA interventions ever – almost all are into small firms and sole practitioners – and Mr Barnett said there were 7,500 live files and 180,000 dead files to deal with. The SRA faces a particular problem with personal injury clients, who will need to be signed up to conditional fee agreements and after-the-event insurance before implementation of the Legal Aid, Sentencing and Punishment of Offenders Act 2012 on 1 April if they are to benefit from the recoverability of success fees and insurance premiums. The firm is likely to be made insolvent before administrators are called in to deal with creditors. The full SRA statement said: “The Solicitors Regulation Authority (SRA) has intervened into the practice of Guy Barnett, Matthew Montanaro, James Paul Howard, Constantina Nicolaou, Mellonie Elaine Ward, Joanne Warren and Kellie Angie Maguire at Blakemores Solicitors LDP, which has offices in Birmingham and Leamington Spa. “The practising certificates of Guy Barnett, Matthew Montanaro, James Paul Howard, Constantina Nicolaou, Mellonie Elaine Ward, Joanne Warren and Kellie Angie Maguire have not been suspended. “It was necessary to intervene in order to protect the interests of clients (or former or potential clients), or the interests of the beneficiaries of any trust of which Blakemores Solicitors LDP or any of the partners of Blakemores Solicitors LDP is or was a trustee. “An intervention means the SRA has closed a firm with immediate effect. We will stop the firm from operating, take possession of all documents and papers held by the firm (including clients’ papers), and take possession of all money held by the firm (including clients’ money). Blakemores was founded in 1961 by Roger Blakemore to specialise in conveyancing. Mr Barnett led the firm through major expansion in 2002. I worked for the firm more than 10 years ago. In the short time I was there, I always had reservations about its precarious business model and style of management. That was then and that is all I wish to say on the matter. However, for those ex-employees who have been gloating on the Law Society Gazette website, please stop for a moment. Instead, join with me in wishing well to the 250 people who have lost their jobs. I say to these former staff members, you will no doubt all be feeling very low right now. I urge you to keep in contact with each other and offer mutual comfort and support in this difficult time.